This is one common issue which user keep facing while using Firefox. I have got numerous complaints myself about many of my websites from readers that the sites open perfectly in Chrome Browser and Opera or Safari but they do not open in Firefox Browser at the same time. Well, this may not be a very particular issue per se but there are some things you may try for instance try Resetting all your data in Mozilla Firefox or restart Firefox with all extensions disabled. Firefox describes this as the most easy way to fix various kinds of problems that might have cropped up in the Firefox browser after using it for quite some time. The best part is resetting Firefox does not delete any of your profile information. Instead Firefox creates a completely new profile folder and keeps all you data like Bookmarks, Browsing History, Passwords, Cookies and auto-fill information safe. After the reset process is over, Firefox will place a copy of your old profile on your Desktop. 1. 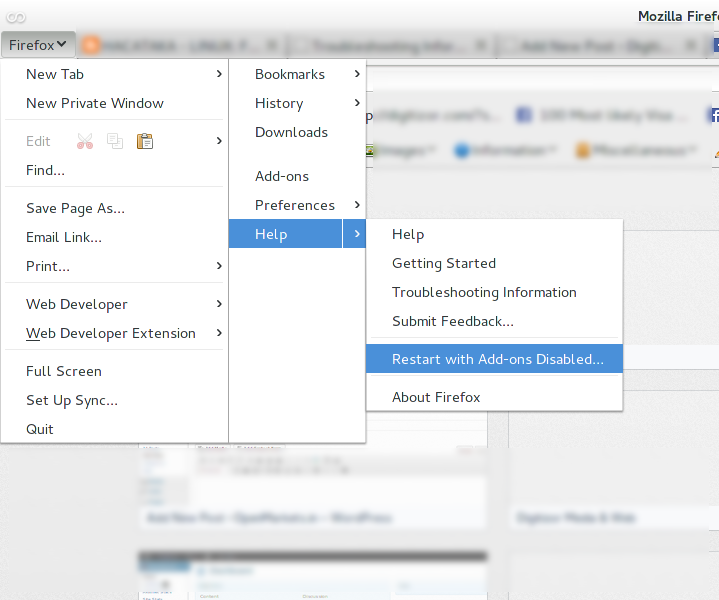 From the Firefox main menu bar open the Troubleshooting Information Tab by going to Help > Troubleshooting Information. 3. Click Finish in the ensuing process to complete your Firefox browser reset process. However, if you are not able to see the Reset Firefox button in the first place. You may want to try an alternate method of restarting Firefox with all your addons disabled.